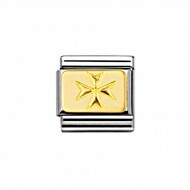 Composable Nomination Classic Gold Engraved Signs Cross of Malta Charm, a stainless steel base link with 18ct Gold. Composable Nomination Classic Gold Engraved Signs Happy Birthday Charm, a stainless steel base link with 18ct Gold. Composable Nomination Classic Gold Engraved Signs Heart with Ti Amo Charm, a stainless steel base link with 18ct Gold. Composable Nomination Classic Gold Engraved Signs Moon and Stars Charmm, a stainless steel base link with 18ct Gold. Composable Nomination Classic Gold Engraved Signs Plate Charm, a stainless steel base link with 18ct Gold. Composable Nomination Classic Gold Engraved Signs Plate with Screws Charm, a stainless steel base link with 18ct Gold. Composable Nomination Classic Gold Engraved Signs Sun Charm, a stainless steel base link with 18ct Gold.